can i use this recipe to make a 9 by 13 cake ? I used this recipe to frost a 9×13 cake and it was the perfect amount. And very tasty! I’m wondering the exact same thing. I did! I just made this to top cupcakes for Halloween. The orange dye (yellow and red liquid food color) had no negative effect on the taste or consistency! It was fantastic frosting! How long can you keep the frosting before it goes bad? Why do some butter cream recipes use unsalted butter? I live in Poland and the confectioners sugar here is wonky, to coarse or something. So nothing ever tastes right, except for this. The method really made up for the local ingredients, My kid just declared this the best frosting ever. Thank you! Just put regular sugar in a food processor with a cutting blade, process it for a while, with some pulses, and you might get something quite close to confectiner’s sugar. Can you half this recipe and be able to cover a 9 x 13 cake? My family does not like a real thick layer of icing on our cakes. I made this recipe like it states, but it ended up being very thick on my 9 x 13 cake. Also, because you put cream or milk in it and it is not cooked, do you have to store it in the fridge? You can half the recipe if you’d like less on that cake. Yes, does need to be refrigerated. I just made the cake but want to freeze until next week – should i frost it before freezing or next week when I serve it? I would wait to frost the cake until after it’s defrosted or close to time to serve it. Thanks! Hi is it salted or unsalted butter? Thank you! It is salted butter in this recipe. I hope you enjoy it! Thanks! does that mean 3-4 cups of sifted confectioner’s sugar or 3-4 cups of confectioner’s sugar that is then sifted? I am not sure if I need to sift the sugar and then measure or measure the sugar, then sift it. measure the sugar, then sift it. Hi, I made this vanilla buttercream frosting today for your chocolate cupcakes and the cupcakes turned out great and so delicious. But the frosting was kind of a disaster, it turned out grainy and wasn’t at all pretty, white, or smooth. I halved the recipe. Is there something I may have done wrong? I would appreciate an answer, as I usually never fail with a recipe and also I would love to do these cupcakes again with this frosting. 2. You did use the correct type of sugar, but did not sift it adequately. It’s important to beat the softened butter first (and all at once) until it’s creamy and light. 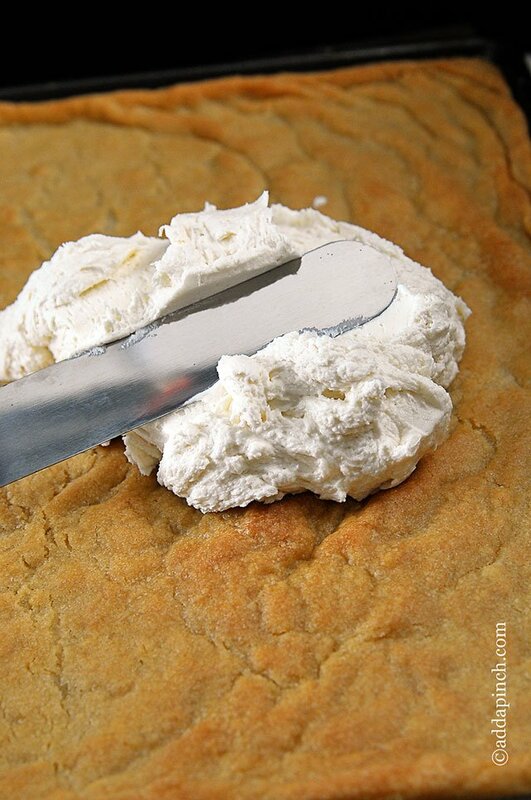 Until I learned this my buttercream icing often ended up grainy. I hope you enjoy it, Julie! Thank you very much for this recipe as well as the chocolate cake recipe (all of the versions!) which I’ve baked several times over the past couple of months with great success. 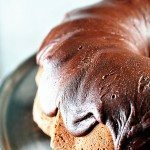 I love baking but had gotten tired of my two go-to chocolate cake recipes. This recipe is so easy and quick and with three children including a newborn this is exactly what I need ? Just want to add that this is the best and most descriptive buttercream recipe ever. 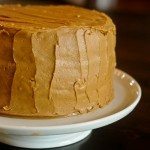 I stopped making buttercream after several grainy attempts and mostly use store bought fudge icing. Beautiful fluffy almost completely white buttercream icing. Lovely! I now have the perfect cake for New Years Eve. Thanks again! I pinned this awhile ago but don’t believe I tried it until today. I often make buttercream but everytime I forget which exact recipe I followed 😀 So today I followed this one and I loved your tips explaining how to make it the best rather than just throw all these things together. It came out delicious and I love how it was hard after frosting so the designs aren’t dripping away like I’ve had in the past. It looks professional! Due to lack of time (and patience lol) tonight I just quickly shook powdered sugar one cup at a time into a measuring cup and then mixed it in, and repeat. I did the full 4 cups. I also used probably the full 3 tbsp of milk. It came out the perfect consistency. We added a few drops of red to make it pink. It’s delicious and this will be my go to recipe now! Thanks!! is this recipe enough for a 10 inch and a 8 inch cake? I tried this for my son’s birthday last month and it was BY FAR the BEST buttercream I’ve had!! I’ve searched high and low the last 3 years for a good one and this is going on my recipe book! We have lots of birthday parties in our family and I’m beyond thrilled to have found the one!!!!!!! THANK YOU! Hi! I was wondering how much of this i should make for a 3 layer 6-inch cake? (frosting outsides and between the layers). Thank you in advance! I tried this recipe for a cake I made for a colleague earlier this week and it was absolutely delicious! Your tips were so useful too , they made the whole process of making it much easier. And I don’t even have a stand alone mixer, just used a good old hand mixer, so I can only imagine how better it could get if I did have one. Thank you so much for sharing, I will use it again! Thanks so much, Nadina! I’m so glad you enjoyed it! I cannot begin to tell you how grateful I am for this recipe. Not only did I use your vanilla buttercream icing recipe, but I also made your best ever chocolate cake. I was designated by my friends to make a birthday cake, which I did last minute early in the morning on the day. I found your chocolate cake, which was deliciously moist. Only down side is I could taste the one teaspoon of salt, but then again I reduced the sugar to one cup instead of the two. But the vanilla icing made up for everything. I made a double staked cake so i used the cut out pieces and whisked it with the vanilla icing. It came out really pretty and made the whole cake amazing. My friends and the birthday girl could not stop talking about how delicious it was. Thank you for making our day with your recipes. I’m so glad you enjoyed this frosting and the Best Chocolate Cake Ever – I love this combination too! As far as the cake itself, you are correct about the reduced sugar being why you tasted salt in the cake. Could I use this frosting to make roses or decorations? If so, by how much should I alter the amount of powdered sugar I add? Will the cake need to be refrigerated if using this buttercream icing? There’s no need to refrigerate. I hope you enjoy it! 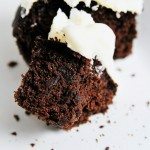 How do I make my buttercream smooth not grainy if I use confectioner’s sugar? If you prepare it according to the recipe instructions, it should not be grainy. Besides, I don’t think confectioner’s sugar would be grainy. I hope you enjoy the frosting. Thanks! If I want to use almond flavoring, should I still use some vanilla as well? I was thinking 1/2 tsp of vanilla and 1 1/2 tsps of almond. Or is almond too strong and should it be 1 tsp of each? Thank you!! I would start by adding a 1/2 tsp of almond, and than mixing. Taste your frosting and decide whether you think it needs vanilla, more almond, or if it is perfect! I recently took up a hobby for baking (after watching the great british baking show) but I’ve found that whenever I make buttercream frosting, it is always grainy and so runny that I can’t pipe it. Troubleshooting? Also is confectioners sugar the same as powdered sugar because usually buttercream calls for powdered. Thanks. Baking is such a fun thing to do! I’m glad you enjoy it! 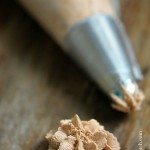 One thing I’ve found that causes that with buttercream can be if butter has gotten too soft or melted. And you are correct about confectioners and powdered sugar being the same. Could I crush up some Oreos to put in the icing and make cookies and cream buttercream? Also, could this icing be put on the cake and refrigerated the day before it’s eaten? I’ve never crushed up cookies in the frosting, but it sounds delicious! Let me know how that turns out! You can definitely make the cake and frost it the day ahead, but there’s not a need to refrigerate it. It will be fine for a few days without refrigeration – I just put mine on cake plate with cover. Could I crush up some Oreos real fine and toss them in to make it cookies and cream buttercream? Also, could I put it on the cake and refrigerate the day before the cake is eaten? I just LOVE LOVE LOVE this recipe. It’s the best one! Simple yet delicious! And SO easy to use. I’m a beginner and I used this recipe for the first cake I ever made. My cake was perfect! Yay, that’s wonderful Wendy! I’m so happy you had such success on the first cake you’ve baked – that’s a wonderful feeling!!! Is the boiling water necessary? I think you may be referring to the Best Chocolate Cake that has boiling water in the recipe since there is none in this frosting recipe. If that is the recipe you are asking about, it is very necessary to use the boiling water as in the recipe for the best results. Thanks! This recipe + the chocolate cake is unreal. Thank you! 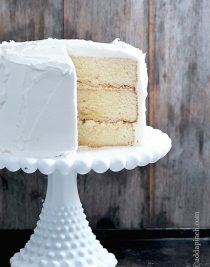 Question- I made this and frosted some cupcakes right away, and it was bright white- beautiful! Then, I put the rest of the frosting in the fridge and frosted the remaining cupcakes 6 hours later. They were not bright white at all but more yellowy. I refrigerated all cupcakes and the next day the first batch was still bright white, the second batch still yellow. What? I’m so happy you enjoy the cake and the frosting! I’m sorry, but I’ve not this happen before with the frosting turning off-white. But if I ever refrigerate my buttercream frosting, I put it in an airtight container…then when ready to use, I let it come to room temperature, and then beat it again with the mixer until really fluffy. I hope this helps! Ok I made the cake first completely following the directions and tips. Then the frosting and doubled it as you suggested. Two things:. One the cake was so good it didn’t need frosting! But I frosted it for my ten year old who has autism and is very picky about cakes. He doesn’t eat candy, cookies or chips like typicall kids. He only likes cupcakes or cakes, frosted of course. The second thing is:. He absolutely loved this cake and got a kick out of it being three layers! He gave it a two thumbs up! Thank you for the recipe! First of all, this frosting turned out delicious!!! Except I had to add literally twice as much sugar as the recipe stated. After coming up with really soupy “frosting” I looked up the butter to sugar ratio for buttercream and it said it was 4:1 instead of the 2:1 this recipe called for. I’m thrilled that you enjoyed the frosting! I’ve never had it turn out soupy, nor have I had to double the sugar. It’s always the perfect consistency every time I make it, so I can’t be sure what happened. Thanks! 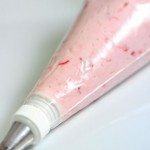 Can you add pink gel coloring to make it pink icing? Hi please help. I am panicking. lol. seriously. my daughter’s graduation party is in Am and I am doing cake and cup cakes .. piping buttercream roses to the cake will this recipe work for that? What about adding color to make the Roses yellow or purple thank you? If I can color the ice icing what kind of coloring should I add liquid gel or? This icing goes well with chocolate or vanilla cake correct? I know this is a lot of questions but one more thing when stacking round cakes on top of one another do I need to add support? Any help or advice forever appreciated. thank you kindly. 4. Add milk, heavy cream or half-and half until yhe frosting has reached the preferred consistency. Yes, you are right that you get to choose which you will use for the recipe! How long is the cake supposed to bake? It doesn’t say in the recipe above? If you click back to the Best White Cake recipe it gives all the detailed baking instructions. Enjoy! Thanks! How much frosting does this recipe make ? I’m planning on making a 4 layer 8-inch cake this week. 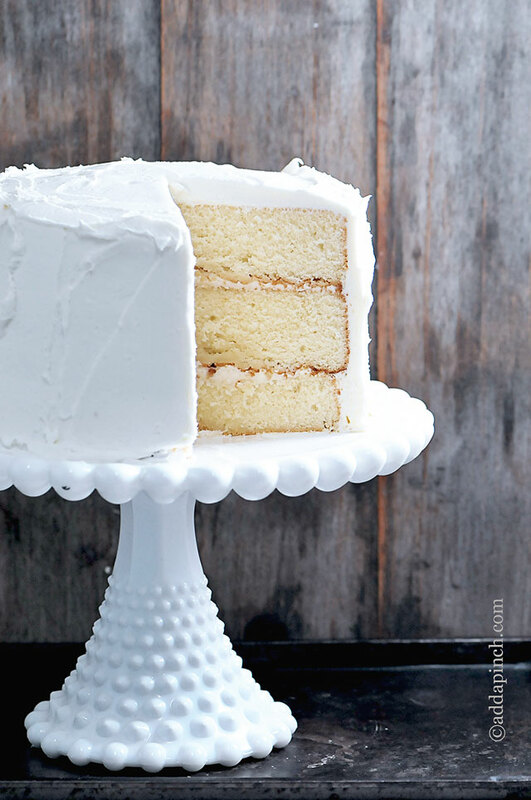 I’m not a professional, but I noticed in her white cake recipe (three 9-inch layers) she recommended doubling this frosting recipe…so maybe the same for your cake? That is what I’m planning to try. Love your recipes and have made them several times Now! Wanted to change things up a bit and used coconut oil to cake and added a teaspoon of coconut extract. Still in oven. Now I’d like to make coconut buttercream. Do I replace vanilla extract with coconut or just add coconut extract to recipe? Can I color the frosting to any color ? This is the best butter cream frosting I’ve ever made! Thank, this is my new go to! Thanks so much, Arlene! I’m thrilled that you enjoy them! I am going to try this frosting for my daughters cake this weekend. The party is Saturday afternoon. However, I would like to make the cake on Friday afternoon. Is it ok to leave it out frosted for one day? Or do I have to refrigerate? I am afraid it will dry out if I refrigerate it. Let me know. Thanks!! The recipe says “vanilla”; nothing about vanilla extract. But you reference the extract later. Plus, I see black specks in the frosting, which leads me to believe that it is just vanilla bean for flavor. Is this correct & can just use a couple of vanilla beans split & scraped? I’ve not added vanilla beans, so you could possibly see a shadow. If you want to add vanilla beans to the frosting it should work fine.